They happen every single day, yet witnessing a sunset can, in the moment, sometimes seem like a once in a lifetime event. Whether it be climbing to a vantage point to view the sun descend over a historical city or watching it melt into the ocean from a beach, is one of nature’s ways of making the sky, and surrounds, seem spectacular. Take a look at these sunset destinations, where you’ll find the most impressive spots to watch the day disappear (and get the perfect #nofilter shot!). Away from the neon lights and lasers of its clubbing scene, Ibiza's natural beauty provides another side to this party island. Hilltop villages and the northeast's quieter beaches offer serene spots to watch the sun go down. 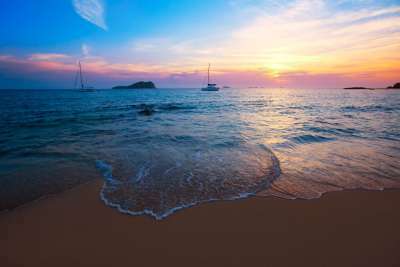 Busier coastal locations such as Benirrás Beach and Cala Conta are popular places to end the day too, with a cocktail in hand to watch the scarlet sun disappear into the Mediterranean Sea. Ancient monuments, imposing volcanoes, endless rice field mazes and of course, those dreamy paradisical beaches; these are what make Bali such a popular destination for adventure-hungry travellers. Its diverse and exotic landscape becomes otherworldly at sunset. The mystical Yeh Leh Beach for example, is a beautiful dawn spot. As the sun sets, its unusual boulders and rock pools reflect the changing colours of the sky. 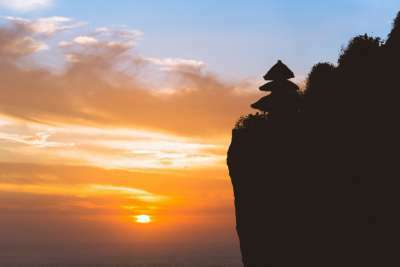 Or visit Uluwatu Temple, perched on a steep cliff 70 metres above the sea, and see the temple silhouetted against the sky. 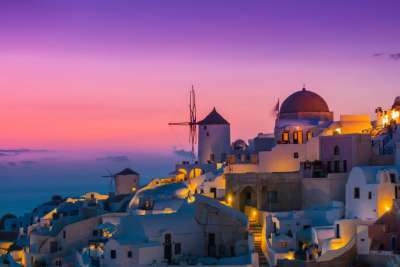 The beautiful Greek island of Santorini's whitewashed and pastel coloured buildings, are all the makings of a beautiful sunset spot. The iconic view of the cascading houses surrounded by the azure Aegean Sea, can be seen from the village of Oia. Being the image that you'll find on every single postcard on the island, Oia does tend to draw in the crowds, so if you fancy a more secluded spot, head to the lighthouse at Akrotiri on the other side of the island, for an isolated but beautiful sunset. 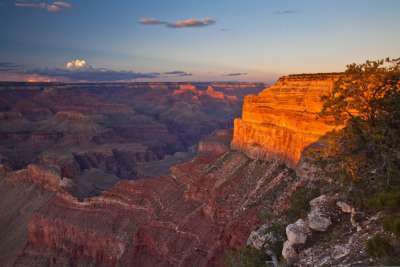 The Grand Canyon's sheer vastness and size makes it impressive no matter what time of day you visit, but when the sun sets, and ripples across its ridges, showcasing a variety of red and orange-y hues, it really is a sight to behold. Being one of the seven natural wonders of the world, this two-billion-year old expanse is really like nowhere else. See it from the South Rim to take in the archetypal view or explore from below on a raft along the Colorado River. Western Australia (in fact, Australia as a whole) is spoiled for mesmerizing sunset spots. But the city of Perth really has one of the most spectacular. 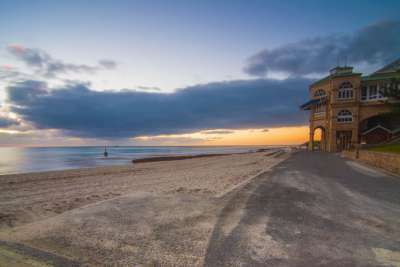 Cottesloe Beach, one of the city suburb's most popular beaches, is a great place to enjoy a chilled glass of wine and watch the sunset. The blue waters of the Indian Ocean, paired with the beach's white sands, have made this place a favourite holiday spot for both Perth locals and tourists for many years. Algarve's coastline of glorious beaches and jagged rock sculptures are all the makings of a great sunset destination. The famous Praia Da Marinha is one such beach, that is constantly voted as one of the most beautiful beaches in the world, due to its abstract rock formations. 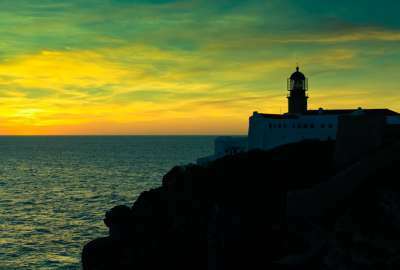 Cabo de São Vicente is another impressive spot to watch the sunset; it's the most south-westerly piece of land in Europe, once considered the end of the earth before the discovery of the Americas. Today, its colourful sunset skies still convey a sense of magic and mystery. Scotland's capital's many hills and vantage points give it some of the best sunset view points in the UK. The sunlight, that covers the city's old town in an amber glow and lights up the castle, will warm you up even on the chilliest of days. 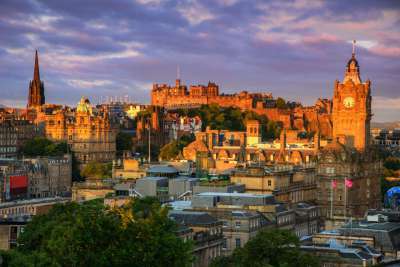 For striking views of this truly picturesque city, climb to the top of Arthur's Seat or the jagged Salisbury Crags. For a slightly less strenuous, but equally impressive view, you can also walk to the top of Calton Hill, that is home to several impressive monuments. Rio's scenery is pretty iconic; the lush mountains frame this bright and vibrant city, whilst its coastline is dotted with tiny islands that can be seen from of its many lively beaches. Sunsets here are dazzling, with the sky transforming into a collage of pinks, reds, oranges and yellows. Many argue that the best views are from Sugarloaf Mountain, where you'll be able to see Christ the Redeemer in the distance as the day descends into night. 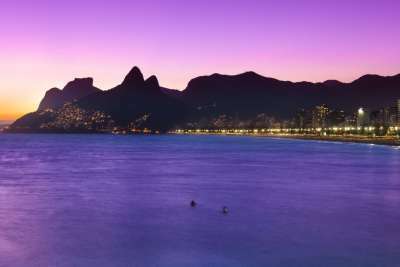 Failing that, pick a beach bar and watch the sunset with a Caipirinha in-hand. 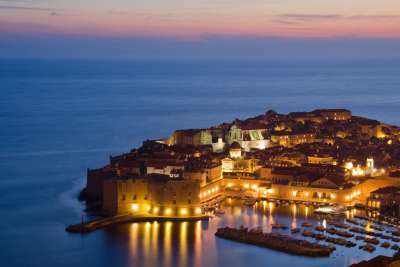 The enchanting walled city of Dubrovnik's orange-roofed old town and surrounding turquoise waters, is simply beautiful at sunset. Walking the walls of the old town is one of the best ways to enjoy views of the Venetian-style buildings, that burn a bright yellow colour as the sun glints off them. Alternatively, find one of the bars hidden outside the walls that look out perilously onto the cliff face and sea to enjoy the views with a chilled beer. Is there anywhere more synonymous with paradise than Hawaii? Any picture of this tropical island will feature wanderlust-inducing images of sandy, palm tree-fringed beaches, with the sun setting in the backdrop. Adventurous explorers will able to go even further and explore the island's volcanic landscape and see the island in its full glory. 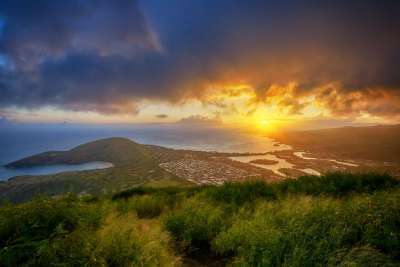 Mount Haleakala and Diamond Head are both epic spots to watch the sunset, offering spectacular scenery and glorious views of the island.